The little earth hutia's habitat includes low, dense vegetation. It was first described in 1970 from Cayo Juan Garcia, on the south side of Pinar del Rio Province off of southwestern Cuba. It was reported to have been extirpated from this location by 1991. It also may occur on nearby Cayo Real. 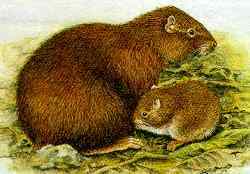 It has been suggested that the reasons for the little earth hutia's decline may have been: 1) hunting by humans; 2) competition with introduced rats Rattus rattus; and 3) habitat loss, first by fires lit by fishermen to drive off mosquitoes and then by a huge increase in human activity in 1988 - 89, which left virtually no suitable habitat. 2004: Occurs in Cuba (IUCN 2004). 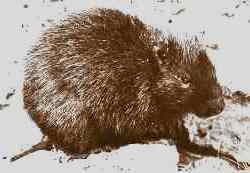 The little earth hutia was first described in 1970 from Cayo Juan Garcia, on the south side of Pinar del Rio Province off of southwestern Cuba. It was reported to have been extirpated from this location by 1991 (Alvarez & Gonzalez 1991) . It also may occur on nearby Cayo Real (Lidicker 1989) . The little earth hutia's habitat includes low, dense vegetation.